Get Your Amex Ready — Roseark's Slashing Prices! Inspired by all the gorgeous gems from last night's star-studded event? 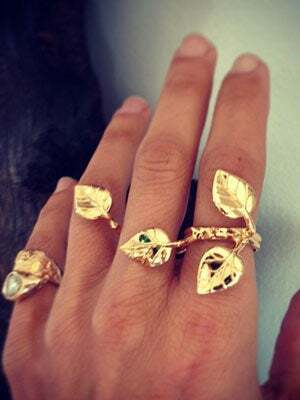 Well, brace yourselves — the jewelry mecca that is Roseark has some stunning Kathy Rose and Roseark pieces for 25% off. The baubles may still be on the pricey side, but at least you'll be able to adorn yourself like an A-lister without really spending like one! The loot includes delicate gold cuffs, eye-catching black diamond and fire opal studs, exceptional arrowhead pendants — and don’t even get us started on the rings. Yes, you'll probably have to give up that venti soy latte habit to make up for all the moola you'll be shelling out, but who needs caffeine when you've got covetable and celeb-approved baubles, for way cheaper than the original asking price? Hit up the brick and mortar, or peruse online — you'll be happy you did. Think about how many calories you'll cut by eliminating those sugary beverages. Where: Roseark, 111 North Crescent Heights Boulevard (near Santa Monica Boulevard); 323-822-3600.